Female Common throughout Great Britain and Ireland, stated by Luff to be 'extremely common' but in our experience around Watford that may be overstating the case. Having said that they are certainly more common in some years than others; common everywhere during 2006 but much less so in 2007. They occur in all kinds of damp situations being equally common in dark shaded woodland and open riparian habitats exposed to sun or even domestic town gardens (from pitfalling). We have records from all months of the year; they are most obvious on hot spring days and, for that matter, nights as well as they are active nocturnally. Spring and summer breeders (Luff), our single observation of their mating was on 01/01/07, an exceptionally mild spell, among thick moss on a willow trunk in Cassio nature reserve. 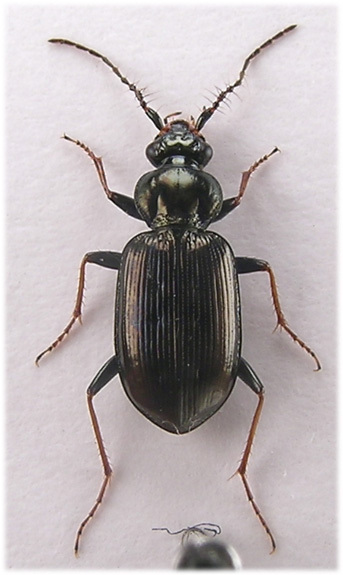 They fly actively and are oftenfound, day and night, among large populations of other carabids especially in riparian situations e.g. 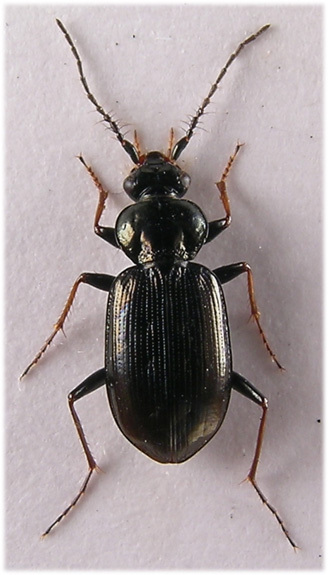 Bembidion lunulatum (Geof. 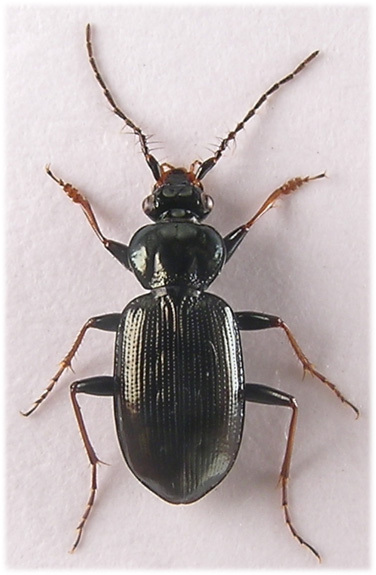 ), Paranchus albipes (Fab. 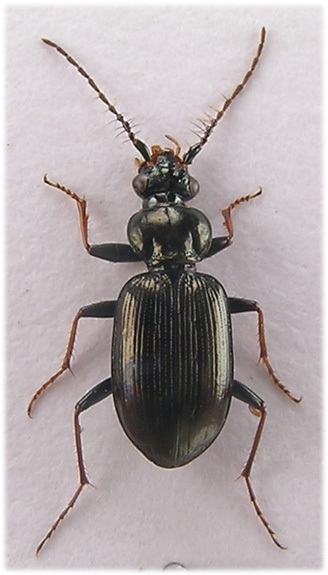 ), Elaphrus cupreus Duft. etc. Occasionally found far from water e.g. among leaf litter around the tennis courts in Cassiobury park (Feb 2007). Adults and larvae ¹ are strictly carniverous (Forsythe), both have specialised mouthparts adapted to trapping springtails (Collembola) and mites. 6-8.5mm. With a little experience recognised at once in the field under a lens or by naked eye with good eyesight ², the strongly foveate elytra and habitus are very distinctive. Antennae unique, black, first segment very long with long setae to segments 2-6 and third segment curious; elongate and medially constricted. Head with two fovea between prominent eyes, with a single seta and finely punctate inside eyes. Viewed from the side the numerous forwardly directed setae of the specialised feeding apparatus are obvious. Pronotum evenly rounded to front margin, hind angles obtuse, basal fovea wide, deep and produced forward and with an elongate impression on disc anteriorly. Lateral margin bordered and basal area punctate. Elytra with ten well developed and punctate striae, with three foveate pores between third and fourth. Scutellary stria absent. Tibiae, tarsi and mouthparts light brown to reddish brown, otherwise entire beetle black usually with a metallic green or bronze lustre. Protarsi with three basal segments strongly dilated in male. ¹ Bauer,T. and Kredler, M. 1988. Adhesive mouthparts in a ground beetle larva, L.pilicornis and their function during predation. Zoologischer Anzeiger; 221, 145-156. ²One of our twelve year old members can, so he assures us, distinguish Loricera at an hundred metres in dense fog.